The best way to support us is by becoming a member. By joining us as a member you will benefit from regular updates about the work of the Trust, invitations to events and volunteering opportunities. With your support we will be better able to deliver this exciting project, bringing new life back to an important piece of our local history. Membership of the Trust is open to anyone who is interested in furthering its purposes, and who, by applying for membership, has indicated his, her or its agreement to become a member and acceptance of the duty of members as set out in our constitution (see our Documents page). A member may be an individual, a corporate body, or an individual or corporate body representing an organisation which is not incorporated. Differential membership rates are set out below. To keep administration to a minimum we prefer to receive membership applications online, via Paypal. However, we do also offer the facility to send us a cheque or make a bank transfer. Please click on the ‘Join Us’ button above. We will first ask you for a few details for our own records, such as e-mail address, name, postal address and phone number. Once you have completed that and a short verification process, you will be taken to our payment page, where the various payment options are explained. All membership applications are subject to completion of payment, and approval by the Trustees in accordance with the Constitution. Decisions will be notified within 21 days. Membership may only be terminated in accordance with the Constitution. If you encounter any problems, please contact us on info@bricketwoodstationtrust.org.uk. 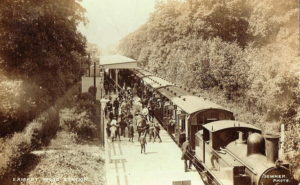 Bricket Wood Station Heritage Trust will use the information you provide to us to be in touch with you and to provide updates about the Trust’s work. We will ask you by which methods you wish to be contacted (E-mail, Postal or Text Message). You can change your mind at any time by clicking the unsubscribe link in the footer of any email you receive from us, by contacting us at info@bricketwoodstationtrust.org.uk, or by writing to us using the details on our ‘Contact’ page. We will treat your information with respect. We will not pass on or sell your information to anybody outside of the Bricket Wood Station Heritage Trust.